Today, the High Representative of the Kurdistan Regional Government in Italy and to the Holy See, Mrs. Rezan Kader accompanied the President of the Council of Ministers of the Kurdistan Regional Government, H.E. Nechirvan Barzani and his delegation in the Holy See in order to meet Mgr. Paul R. Gallagher, the Secretary for relations with states of the Vatican Secretariat of State. The delegation was composed of the Deputy Prime Minister Dr. Qubad Talabani, the Minister of Religious Affairs, Min. Kamal Muslim, by the Head of the Department of Foreign Affairs, Min. Falah Mustafa and the Spokesman of the Prime Minister, Dr. Safeen Dizayee. 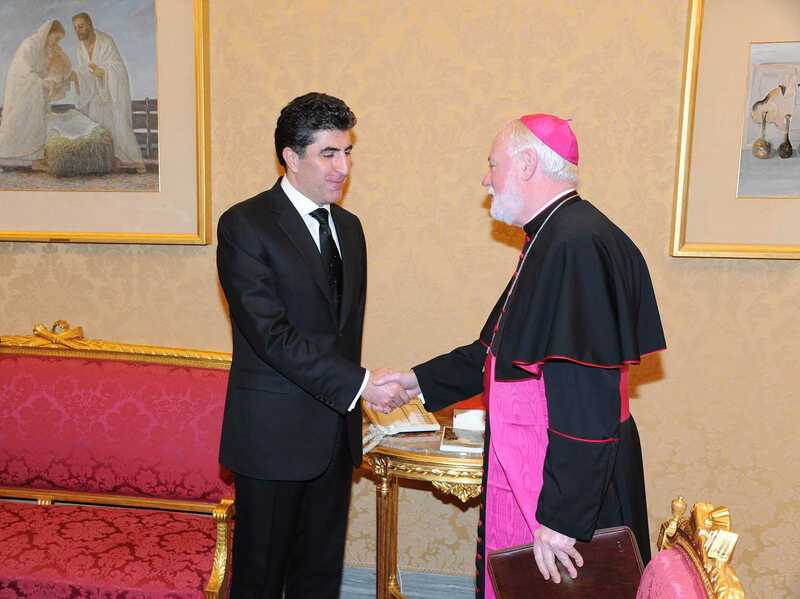 The two sides discussed bilateral relations between the Kurdistan Region and the Vatican. Mgr. Gallagher said that the Holy See observes closely and is closely monitoring the situation in the Kurdistan region and in the entire area. He added that he was very grateful for the visit in order to be updated closely on the developments in the Kurdistan region and throughout the Middle East. The talks focused on the current war against the terrorist organization of the Islamic state, ISIS and the advance of the Peshmerga forces. During the meeting, they also discussed the situation of internally displaced Iraqis and Syrian refugees, who fled the violent repression of ISIS and took refuge in the Kurdistan region. As for the Christian refugees, the Prime Minister called on the Holy See to exert strong pressure on the Christian community not to abandon the Kurdistan Region in which Christians live for centuries and contribute in a fundamental way to the development of the country. The Christian community has never been considered a minority but an integral part of the Region. Mgr. Gallagher has guaranteed the Prime Minister that the Holy See will do everything to ensure that the presence of Christians in the area would be preserved. The Prime Minister reiterated the need for further assistance from donor countries and the international community to help refugees and displaced persons. Mgr. Gallagher praised the Kurdistan Regional Government to provide shelter and assistance to displaced persons and refugees. He also praised the role of the Peshmerga forces in the defense of all the peoples of the region, regardless of their ethnicity or religion, against terrorism. The Prime Minister hailed Mons. Gallagher inviting him to visit as soon as possible the Kurdistan Region.